Map It! Okinawa: "Scenic Route 18 and the Haneji Dam Nago City Bypass"
"Scenic Route 18 and the Haneji Dam Nago City Bypass"
If you are in for a drive or headed up towards the Expo Park or to Okuma, I recommend taking either Route 18 (Green Route above) or the Route 18/Haneji Dam Nago Bypass (Yellow Route above). The latter route bypasses Nago City completely. When headed up towards the Expo Park or Okuma, most people take the expressway and exit the last toll station (Exit 10) and then take the 58 to either the Expo Park or Okuma. The problem with this route is that you tend to run into bumper-to-bumper traffic. Most resorts are along the 58 and so you get an influx of traffic from tourist who use the 58 going north. Both routes will take you eventually to the 58. Route 18 takes you into the heart of Nago City and ends near the Orion Brewery. You will see the "Nago Green Bridge" as you arrive towards the end of Route 18. You won't miss it. It hits you as you skirt around the treeline. The Route 18/Haneji Dam Nago Bypass is what I recommend if you want to skip the traffic all together. Once you arrive to the Highway 58 Interesection you either turn right to go to Okuma or left to go to the NeoPark or the Expo Park. I've included pictures of the Haneji Dam in the photo album. How you get on the route coming south. If you are coming from Courtney or Kadena, take the expressway and get off Exit 9 and go north on 329. Once you pass Camp Schwab, you will soon reach the 331. Hang a right and follow it through a couple of tunnels. Eventually, you will see the Route 18 turn off (See map for landmarks). If you are coming from Camp Hansen or Schwab, just take 329 north to the 331. Once you are on Route 18, at some point you will go through another tunnel and the Haneji Dam turn/intersection will apear. You will see a sign. If you don't turn off, you will continue on Route 18 into the heart of Nago. At the end of Route 18, you will see the "Nago Green Bridge", the Orion Brewery (to the left), and the Nago Castle ruins (to your right). If you do turn on the Haneji Dam route you will then take a nice route over the Haneji Dam. There are some different scenic view points along that route. Eventually you will run right into the 58. How you get to the Haneji Dam/Route 18 from the 58 (coming north from Okuma). There is no visible mark off the 58 to tell you where to turn. 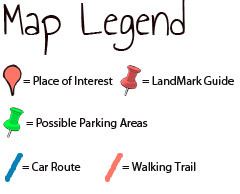 Look at the map closely and at the picture of landmark (see photo album) of what to look for. There is a statue of a small baby boy at the turn off on 58. How you get to Route 18 from the 58 (coming north from Expo or Neopark). Look at the map closely. Route 18 does not start from the 58. There is a large pedestrian bridge at the intersection along Highway 58 where you turn off. I recommend you use Google's 360 Map view to get an idea. Once you make this turn, you will see the Department store, San A. Once you take either route, you will probably end up using it every time you go to Okuma or to Expo Park. You won't regret it. Plus you will see some other areas of interest that you may want to stop by. THIS IS A GREAT SCENIC ROUTE! IT'S PRETTY SMOOTH SAILING. CAUTION. 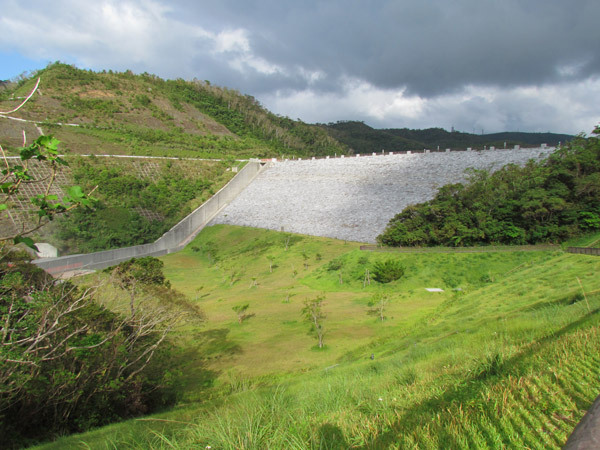 If you take the Route 18/Haneji Dam Nago bypass, be aware of some damage done to the road caused by Typhoon Muifa (August 2011). There were areas that the road was starting to buckle. There were signs that marked the damage. If you go on this route, there may be some construction going on to fix this. Also, there is a bend in the curve where the Okinawans park. This is on the east side of Haneji Dam Bridge. There is a pipe that pours out natural spring water. Some Okinawans stop here to collect water. Just use caution with the driving speed. 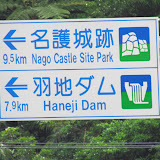 Places nearby of interest: Nago Castle Ruins, The Nago Green Bridge and Lower Park, the Haneji Dam Family Picnic Area.